Opening Times: Club times: Summer (Mid May-Early Aug): Mon, Tue, Thu 1830-2030, Sun 0930-1330, Winter (football season: Mid Aug - Early May): Mon, Tue, Thu 1830-2030 (to 1930 on Tue if football match), Sun 0930-1330. There are no official public times. The track was originally cinder. It was upgraded to an Olymprene synthetic track by En-Tout-Cas in June 1989. 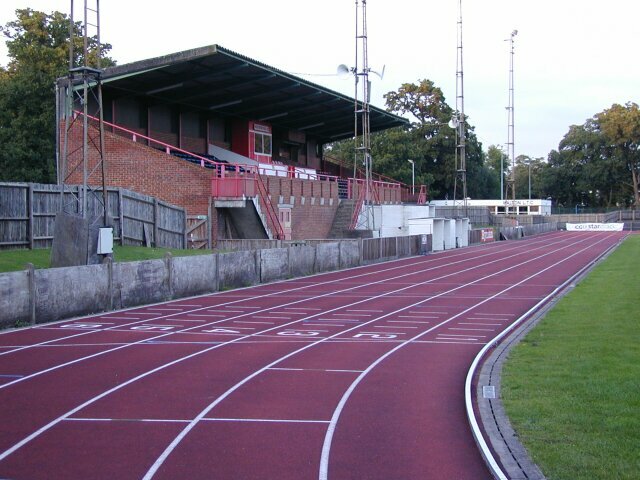 The track is managed by Walton AC on behalf of Elmbridge Borough Council and is shared with Walton & Hersham Football Club whose pitch is in the infield. In addition to the covered stand there is also uncovered terracing on the top bend. There was covered terracing down the back straight but this was declared unsafe and has been boarded up since 2013. The track closed for club training in March 2017 although the track was still usable until the site started to be demolished in autumn 2017 and will redeveloped. A replacement track at Waterside Drive as part of the Elmbridge Xcel Sports Hub next to Elmbridge Xcel Leisure Complex on Waterside Drive opened in September 2017. Some history of the move can be found here.